Heinz Richardson is a local man, he grew up in the area, went to Dr Challoner's and played cricket on Barn Meadow as a boy, a playing field he now looks out on through his bedroom window and where he still wields a bat from time to time. After many years of successful architectural practise in London Heinz has returned to his roots in Amersham, having thought many years ago that he had left for good. When Heinz and his wife Jenny were looking for land to build a house designed for and by themselves, the last place they expected to find it was at No19, Mill Lane; having searched the countryside from Kent to Oxfordshire, they looked at a bungalow on the corner of School and Mill Lanes one day in the snow in 2010. It was a peaceful, quiet day with no traffic, a robin flitted around the house inspecting the property with them, and they fell in love with the East/West site which would give North and South light and amazing potential views from an upper story. Their bid for the house was successful and they spent several years in the bungalow designing a super sleek modernist house to take full advantage of the site, plans that were rejected by the council. After a redesign the plans for the house now standing were submitted, a low energy, contemporary home; these plans were also rejected, a rejection that was larded with some extremely unhelpful comments and small town thinking. But their appeal six months later, heard by an inspector from out of the area, was successful. In the meantime, Heinz, in despair at his house ever being realised, had agreed to be part of a three month cycle ride across America, from Portland, Oregon to Portland Place in London, home of the RIBA, to raise money for charity. The charity for whom he rode is in support of Article 25 of the UN which states that every human has the right to shelter; the light, almost nothing bike that has travelled so far rests on its stand in House 19, like a sculpture. like finish the material acts as a giant sponge, with rainwater that falls on the roof going into the rainwater harvesting tanks beneath the courtyard and the rest soaking into the ground. No rainwater goes into the drainage system. 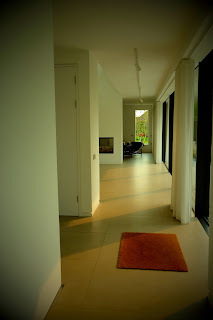 There are several remarkable things about the house: the carbon neutral aspect, the way in which the house is aligned to the landscape, the local materials used, the attention to detail and the aesthetics, all combining to create a calm and peaceful place to live and work. 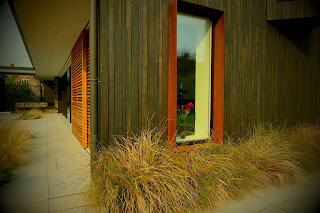 No fossil fuels are burnt in the house; the building is air tight with triple glazing, half metre thick walls, photovoltaic panels, a ground source heat pump and earth ventilation. What this last entails is a vent in the garden with a pipe running underground for 120ft beneath the house, so that the earth warms the air to 12 degrees. This air then comes out of vents in the house supplying constant, warmed fresh air, even in the cupboards. The overall effect when walking in is of a perfectly regulated, fresh environment with no ambient noise; traffic and planes become a remote memory. Heinz's local roots are on show in the flint work on the house which was inspired by St Mary's Church and the many flint cottages in the area, the idea of stained timber cladding on several outside walls was taken from the traditional black painted barns of Bucks. The slowly rusting corten steel window surrounds reflect the iron ore traces around the edges of the flints. Looking at the house from the outside the effect is to make the building recessive in the landscape, nestling in amongst rapidly growing, airy birch trees. From the inside looking out, the perfectly aligned and framed views grab the attention, walking into the house at the end of a white hall and living space is a large plate glass window onto the garden. All the windows in the house are single sheet glass, so the landscape is never divided up into little squares. 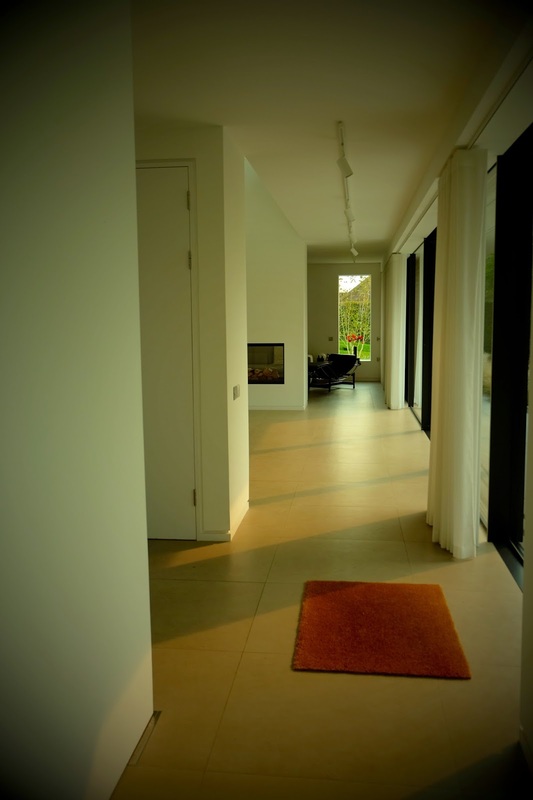 Walking further into the house one wall is double sliding glass doors onto the garden, with an overhang designed to let light obliquely in the summer, with more direct sunlight in winter. The glass walls have sliding western red cedar panels to be used in very hot or cold weather, or to secure the house. The master views are upstairs though, directly to the church one way, to the hills and trees on either side of the valley the other. 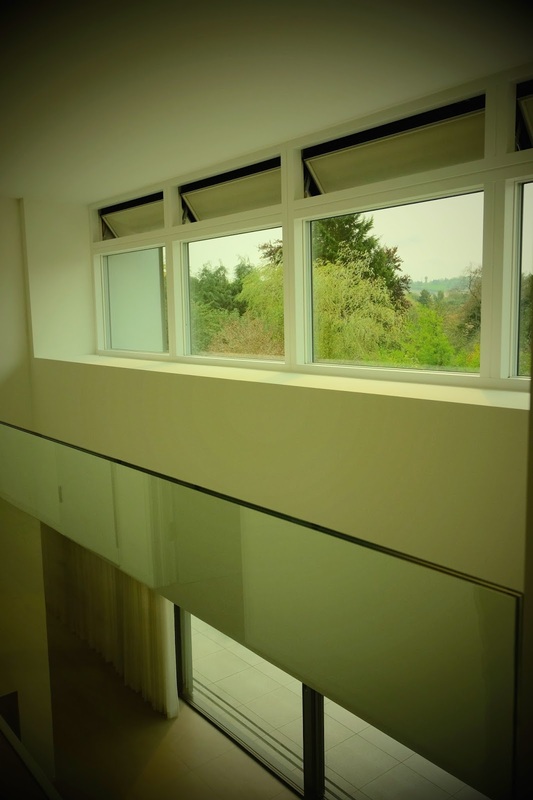 The three bedrooms all have framed views of trees and countryside. The concept of living either inside or outside is blurred at No 19 and perfectly suited to our climate; being able to view an uninterrupted landscape from a warm and comfortable interior is a liberating experience, the weather becomes an experience to be watched rather than some thing to be endured and ignored. The details are astounding, like a slat of clear glass at eye height at eye height in the small annexe shower room so that anyone washing can look out onto the garden; and the numerous cupboards hidden into the walls; and the vents just under the roof to let out hot air after a stifling day. The tall, structural chimney sports a satellite controlled clock that can be seen from the meadow, for cricketers and parents collecting children from school. The elegance and beauty of the house is expressed through the lines going across the building: on the entrance doorway is a six inch wide line through the flint wall of very thin flints laid face on, as in a cross section of layers of thin pastry, hence its name: galetting. The other line is inside, a low, black shlef with a glass fireplace at one end, which continues outside into a black topped box for garden tools. The garden is pleasing and functional, with the spoil from the foundations of the house turned into a two tiered grassy bank for sunset viewing and outdoor performances and the pocket sized wildflower meadows providing enough pollen to run a beehive. A huge corten steel fire pit is for loitering outside on cold nights or watching from inside. a small courtyard beside the entrance with pale grey pebble ground cover and a Japanese maple in the centre has the Zen like quality of quiet contemplation. 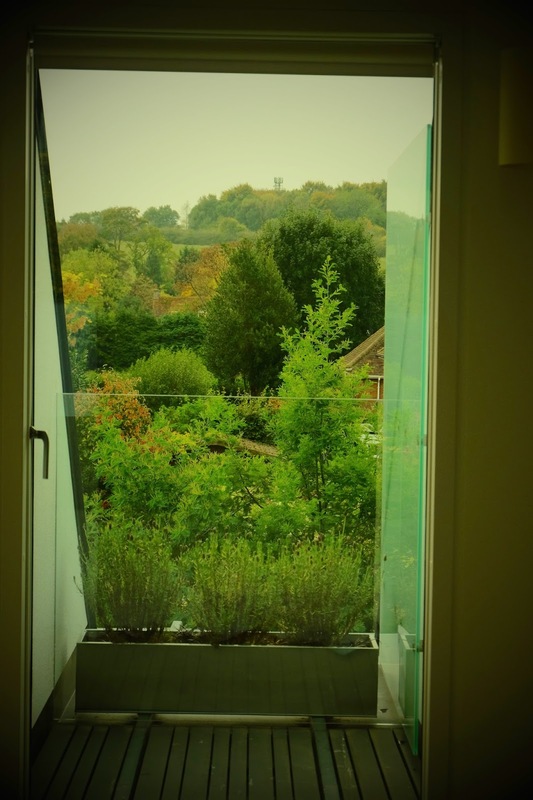 House 19 is a very different house for Old Amersham, heinz has been able to take advantage of all the most contemporary technological innovations and blend them into a lifestyle that is both aesthetically pleasing and a comfortable home. I left floating on light and a decision to seriously declutter my home.